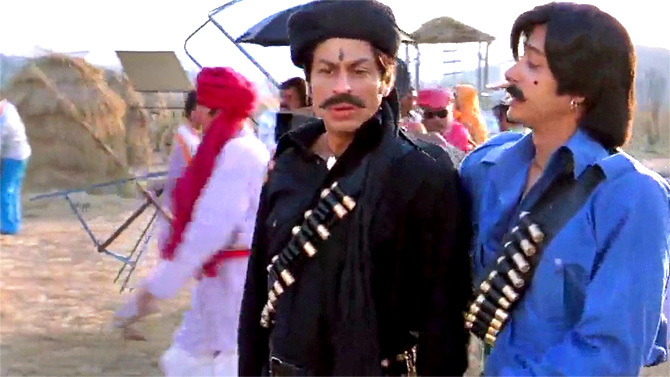 Rediff.com » Movies » Guide, Coach, Halwai: SRK's many, MANY avatars! Guide, Coach, Halwai: SRK's many, MANY avatars! 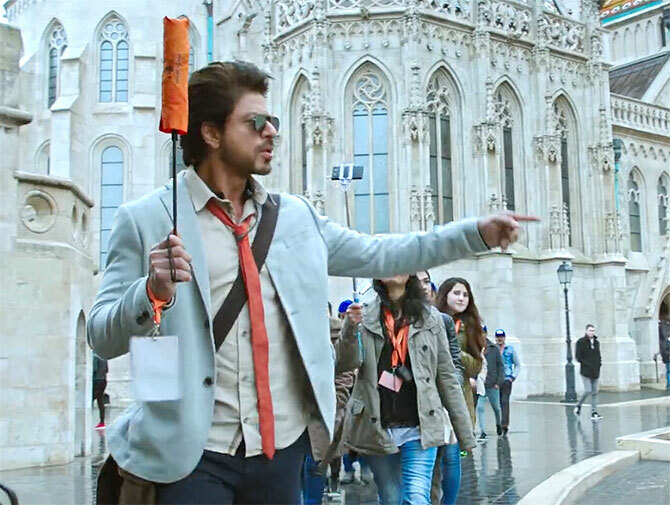 Shah Rukh Khan plays a tour guide in his new film. 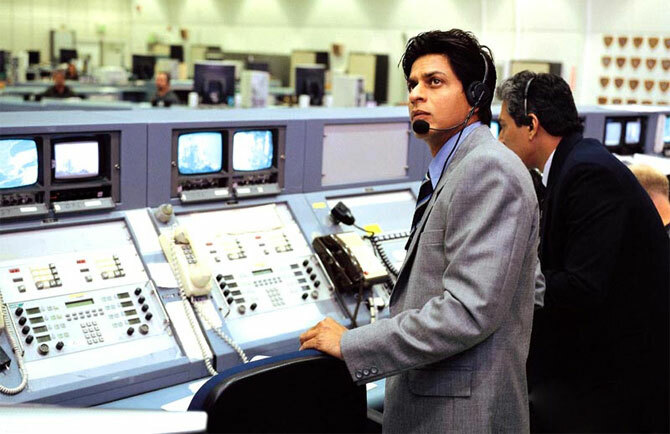 Sukanya Verma looks at SRK's unusual onscreen professions. Actors play cops and crooks, teachers and tycoons, medics and musicians, lawyers and law breakers so often, it's almost refreshing to see them doing something not too run of the mill. Besides lending excitement to the story, what profession they are engaged in on screen explores a unique facet of their personality otherwise prone to typecast. In Imtiaz Ali's romance Jab Harry Met Sejal, Shah Rukh Khan works as a tour guide and develops a special bond with a pretty young traveler (Anushka Sharma) during a sightseeing spree of Europe. On that note, here's looking at SRK's most unusual (by Bollywood standards) onscreen professions. 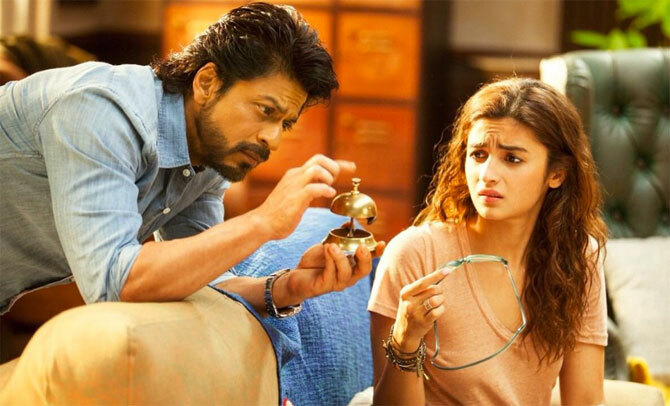 The eloquent superstar is tailor-made for the charming, witty, gyaan-spewing psychologist in Gauri Shinde's buoyant second offering as he helps Alia Bhatt's restless, sleepless character sort out her mind and mess. Charisma colours his eyes and words as he takes centrestage to inspire Salman Khan and bewitch the audience like a true blue magician in a memorable moment of a mostly insipid film. 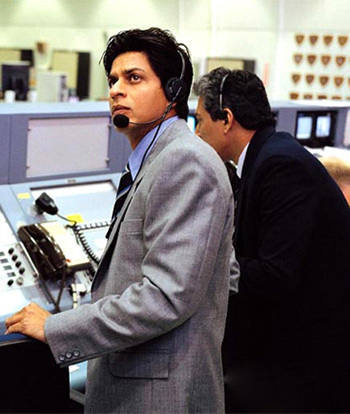 His childhood nanny might have a hard time remembering his company's name, but the audience vividly remembers and reveres SRK's nerdy turn and prestigious job profile as a Global Precipitation Manager at NASA, one that he eventually resigns from to return to his motherland in Ashutosh Gowariker's acclaimed Swades. One of the costliest flops of his career aside, SRK appears rather chuffed about his occupation of a London-based game designer sporting a curly mop and cringe-inducing South Indian accent. But he's completely sidelined once the topmost protagonists of his computer programmes take over and engage in a battle of good versus evil. SRK and speeches go hand-in-hand. He uses this flair to motivate and unite a team of ill-equipped, incompatible set from various regions into a champion side as the coach of the Indian women's hockey team in Shimit Amin's riveting sports drama. Long before he led Indian women's national hockey team to victory, SRK played an upright cricket coach entrusted with the responsibility of resurrecting a floundering college team in Chamatkar. Although it's Naseeruddin Shah's friendly ghost who eventually gets the job done. Deepika Padukone never misses a chance to remind us of SRK's line of work every time the Rohit Shetty entertainer fishes for laughs in its hero's mithai selling skills. 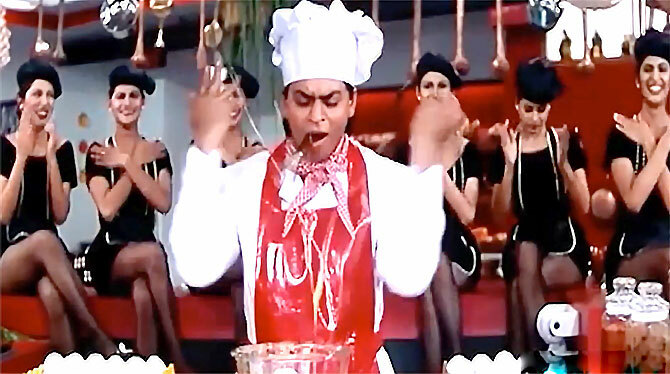 Singing songs with the hotel staff amidst airborne veggies and bubbling dal, SRK plays the kind of chef that exist solely in Bollywood. In Mani Ratnam's lyrical Dil Se.., the actor reports for All India Radio covering cultural news and conducting interviews with notables and radicals. What he does eventually plays a key role in his interactions with the woman he falls for hook line and sinker. 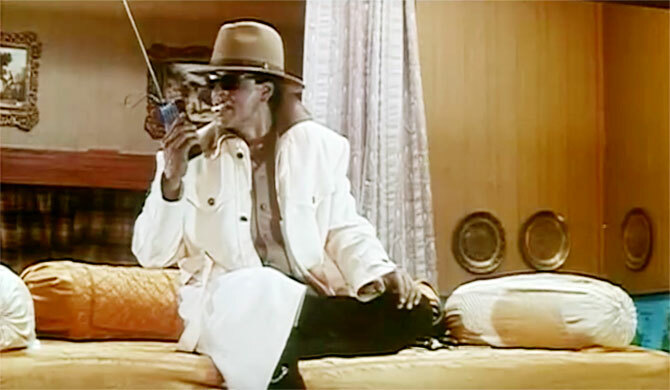 Abbas-Mustan's under-rated rib tickler stars SRK as a goofy private detective. High on his madcap techniques and outrageous gadgets, Baadshah is just the sort of comedy of chaos; Bollywood doesn't get right any more. SRK slips in ethnic garb to look the part of a Rajasthani folk singer visiting the big, bad city of Mumbai to treat his ailing father. With his soulful song and multitasking musician skills -- juggling the flute, bowed string and harmonium, he impresses a shady hotelier and his bratty sister in no time. 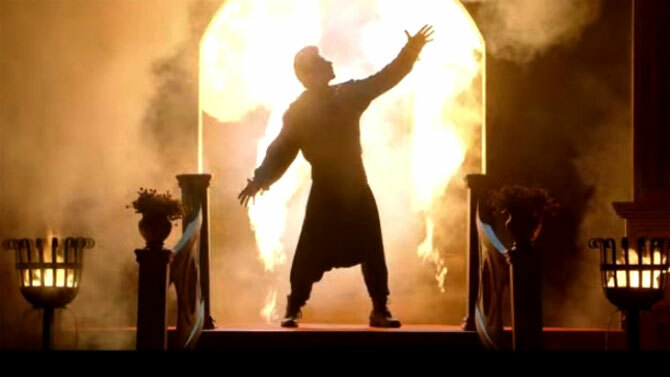 In enacting the star and director of a modern dance troupe, SRK embodies director Yash Chopra's ideals of romance in finding and falling in love with the leading lady of his ambitious new musical: Maya. SRK gets up close and personal with the glamorous and struggling face of showbusiness in Farah Khan's vibrant reincarnation drama. He has played a superstar frequently, but it's his turn as the starry-eyed, enthusiastic extra that lends the plot its humour and sympathy. As the earnest clerk bound to his nine-to-five routine at Punjab Power, SRK displays small-town simplicity with a bashfulness that is in complete contrast to the boisterous car mechanic he transforms into to impress his new bride. When Kajol had butterflies in her stomach!